On Sept. 27 and 28, protesters gathered across the country to denounce the FBI raids targeting political activists in Illinois and Minnesota, and the intimidation of activists there and elsewhere, kicking off several days of planned actions. FBI agents served search warrants and grand jury subpoenas on the activists on Sept. 24 and 27, allegedly relating to political speech in defense of the Palestinian and Colombian peoples. The activists have committed no crime; the real target of the raids are political dissent and free speech. These terror tactics are meant to have a chilling effect on progressive movements. The ANSWER Coalition joins activists, community leaders and progressive organizations across the country in condemning the FBI raids and the persecution of individuals or organizations for their political beliefs. Protests have taken place in Arizona, California, Connecticut, Florida, Georgia, Illinois, Michigan, Minnesota, New Jersey, New York, North Carolina, Ohio, Pennsylvania, Texas, Utah, Virginia, Washington, D.C. and elsewhere. In Minneapolis, where five homes and an office were raided, over 500 people took to the streets. Below are reports from some of the demonstrations that took place this week. Over 500 people came out for a solidarity rally in front of the FBI building. Protesters chanted in a large picket line that blocked the front driveway to the building. Signs read “Hands off anti-war activists” and “Stop the grand jury now.” All major Chicago news media reported on the rally. Stephanie Weiner and Joe Iosbaker, two of the antiwar activists targeted by the FBI raids, were the main speakers at the rally. Other speakers included representatives from the National Lawyers Guild, National Council of Black Lawyers, American Muslims for Palestine, Council on American Islamic Relations, Arab American Anti-Discrimination Committee, Students for a Democratic Society, Chicago Coalition Against War and Racism and the ANSWER Coalition. 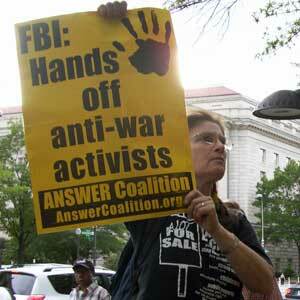 All of the speakers offered the activists support as they struggle to defeat a federal grand jury that is being organized in an attempt to intimidate, smear and divide the anti-war movement. Activists from Washington, D.C., Maryland and Virginia gathered in front of the FBI headquarters in downtown D.C. for a picket line and speak out to condemn the recent raids. Speakers included the Rev. Graylan Hagler, Senior Minister of Plymouth United Church of Christ and President of Ministers for Racial, Social and Economic Justice; Louis Wolf, co-editor of Covert Action Information Bulletin; Patrick McCann, Veterans for Peace; Sarah Sloan, ANSWER Coalition; Sharon Black, Bail Out the People Movement; Medea Benjamin, CodePink; and several others. 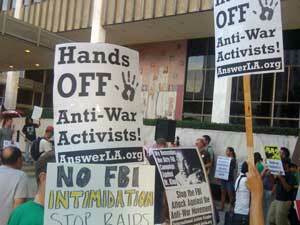 The Los Angeles branch of the ANSWER Coalition joined dozens of progressive anti-war, immigrant rights and community organizations at the downtown Federal Building to demand an end to FBI raids and intimidation. Countless drivers honked and raised their fists in solidarity with the demonstrators. 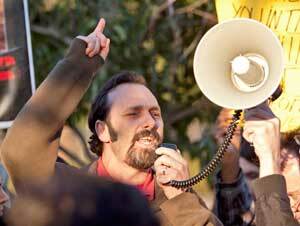 A wide range of social justice organization from the Los Angeles area was represented. Rally participants agreed that any of them could have been targeted by the raids for their leadership in community organization and progressive struggles. Los Angeles activists vowed to build solidarity with activists being targeted by the FBI and to continue the struggle against imperialism and racism. Long-time activists recalled the actions of the FBI in New Haven against the Black Panther Party and other progressive organizations in the 1960s and 1970s, when the FBI regularly wiretapped phones and intimidated activists. It brought charges against Bobby Seale of the BPP, leading to massive protest that shut down New Haven for days. The rush-hour demonstration was called and endorsed by many local groups, including ANSWER CT, Colombia Action CT, the Greater New Haven Peace Council and Unidad Latina en Acción. 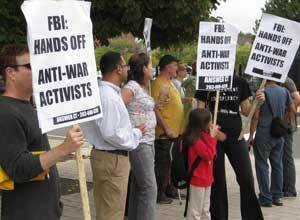 “Let's show the FBI that we're not going to be intimidated by turning out for the October 7th demonstration against the wars,” said Norman Clement of ANSWER Connecticut, urging people to attend a planned demonstration in New Haven on the 9th anniversary of the invasion of Afghanistan. Activists rallied outside the Bricker Federal Building in downtown Columbus, Ohio, to protest recent FBI raids of anti-war activists in Chicago and Minneapolis. The event was organized by Students for a Democratic Society and was attended by supporters of the ANSWER Coalition and other local progressive groups. Activists discussed the extreme tactics used in the raids, such as how the FBI stole personal belongings from those who were raided, including family photos and letters. Protestors discussed the recent FBI assault on free speech with passers-by, many of whom joined the rally. ANSWER organizers promoted the upcoming Midwest regional mobilization on Oct. 16 to protest the 9th anniversary of the Afghanistan war. There was a massive police presence outside the Federal Building despite the fact that the protest did not disrupt anything happening nearby. The demonstration marks the first of many mobilizations that will continue until those whose homes were raided and who have been subpoenaed to appear before the grand jury are fully vindicated. Hundreds gathered in front of 26 Federal Plaza in New York to demand an end to the FBI threats on activists. The speakers asserted the FBI’s role in sabotaging and attacking true social and national liberation movements since its inception. Another underlying theme with each of the talks was an appeal to all left organizations to come together and become more united. Charles Barron, the gubernatorial candidate for the Freedom Party was present at the picket, and stated that once elected, the Executive Mansion would be the headquarters of all activists work. More than 100 people came out to protest the raids at the Federal Building in San Francisco. A number of agents from Homeland Security monitored the evening protest. A wide range of progressive groups participated in the protest.